Maghull Pet Nanny provides an exclusive Home Boarding Service giving one to one attention for your dog in a loving, caring and safe environment. We cater for small to medium sized dogs and although we are based in Maghull we can accommodate dogs from all over Liverpool and Merseyside. Maghull Pet Nanny is set in an acre or private land for walks and playtime. We have large parking facilities and operate flexible opening hours. Go and enjoy your holiday and let your pets holiday with us whilst enjoying all our home comforts. Your pet will stay with us and live as part of our family enjoying walks, toys and lots of cuddles! They can curl up in the evening in the company of our resident dog, Meg. 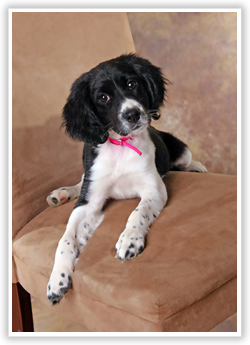 She is a spaniel who enjoys the company of other dogs and has a lovely nature. Do you need to get your Pet to see the vet? I would be happy to collect your pet, remain with them whilst they receive their treatment and ensure they get lots of love and assurance whilst in our care. We will then return your pet back home to you. Out at work all day or away on holiday? No problem. We can provide a range of services including Feeding, Toileting, Playtime and Cuddles for Cats, Dogs, Rabbits and other pets. Our Home Visiting Service is also useful for your short term needs. If you are working late or going to be out all evening then call on us to toilet / feed. We now offer a range of Holistic Dog Grooming Services. Click here for more details. We understand that cats are happy in their own environment but they still need looking after. Maghull Pet Nanny are happy to do home visits to feed, clean and provide some love and affection for your cat. Our service enables your cat to be looked after whilst keeping them in their normal routine. This service also includes securing your home, bringing in mail and putting bins out. Prices start from as little as £7.00 per visit. We understand you want to make sure your pet is in safe hands so if you have any queries at all call Julie on 0151 936 3945 or 07749 960916 for a no obligation chat.